Maintenance – Oil changes help keep parts lubricated and prevent friction from parts rubbing together. Depending on the type of oil your vehicle requires, be sure your vehicle receives an oil change every 3,000 – 6,000 miles. Coolant flushes keep your radiator functioning and helps protect your engine against overheating. Ensuring your coolant level is full and the antifreeze level is correct during the cooler months of the year, helps prevent the fluid from freezing within the radiator. Battery Care – Though many batteries fail in the summer, they struggle in the winter too. The colder the weather, the harder it is for a battery to get started. Make sure your battery is tested each time your vehicle is in for service. The test should also include a visual inspection to make sure all cables and connections are free of cracks or breaks as well as checking to make sure terminals are tight without any loose connections and are clean. Windshield Wipers & Fluid – By now monsoon storms are long gone but that doesn’t mean rain isn’t in the forecast. 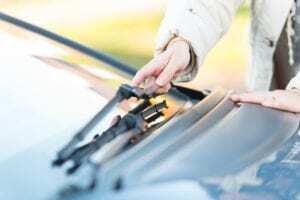 Changing out your windshield wipers every six months is a good rule of thumb, to prevent obscuring your view while on the road when the rain or snow is coming down. Windshield wiper fluid is necessary to clear up your view when coming in contact with dirt and other minor debris you encounter on the road. Make sure your wiper fluid reservoir is full before heading out on the road. Heater & Defroster – Contrary to what some may think, it does get pretty cold in the desert at night and early in the morning. Make sure you and your passengers stay warm on the road by having your heater checked. Be sure to that the defroster is also directing warm air to the windshield properly. Be sure your rear defroster is fully functioning as well. Being unable to see in front or behind you could create potentially dangerous driving conditions. Lights – Headlights, brake lights, and turn signals are imperative when driving. Not only do headlights make it easier for you to see the road, they also make you more visible to other drivers. Similarly, brake lights and turn signals communicate to drivers behind you of your intention to stop, slow down, or turn. Check to make sure each of these safety functions are in proper order, often. Replace any burned out bulbs or replace fuses as needed. Tires – Poor tread depth and tires with low pressure are a hazard to your safety, especially when coming in contact with slick, wet roads. Every ten-degree change in the outdoor temperature decreases or increases the PSI (pounds per square inch). Refill tires with air or nitrogen as needed. Replace any worn or poor conditioned tires. Be Prepared – Make sure you always have a full tank of gas. In the case of being stranded in colder elements, the heater will help keep you and your passengers warm until help arrives. In the event of an actual emergency or break down, pull over to the side of the road, as far as you can to the right side and call for help. Drive Safe – Allow enough time to travel to and from your destinations. Be sure to slow down, especially when it’s raining or snowing. Allow more stopping distance and space between your vehicle and the vehicle in front of you. Stay alert of any inclement weather conditions by checking the forecast before leaving and keeping up to date with any weather changes with weather applications for your cell phone. If you’re planning a winter road trip or traveling through a winter wonderland, don’t let bad weather or a breakdown ruin your ride. When you have your vehicle maintained with Sun Devil Auto, we make sure your it’s ready for the road any time of year. The Sun Devil Auto Oil Change, for example, includes a multi-point inspection that includes a check of your battery, lights, tire pressure, fluids, and more in addition to our premium synthetic and synthetic blend oils, oil filter, lube, and tire rotation! Knowing your vehicle is serviced with Sun Devil Auto, means peace of mind for you, whenever you hit the road. Check out our locations page to make an appointment for your next maintenance service!